After an icy night in our rustic rooms at 4,200m above sea level, we were up early for breakfast and a long drive to the Fauna National Park. Temperatures had touched -5c overnight and we were thankful we’d invested in some thermals – especially as we were due to climb to 5,000m and cross some snowy peaks. Altitude sickness had also begun to sink in and we both were exhausted and short of breathe so needed to take some tablets and plenty of water to get going. The small village was glowing under the sunrise, and despite the cold and fatigue we were all excited to get on the road and see the lagoons and volcanic peaks. 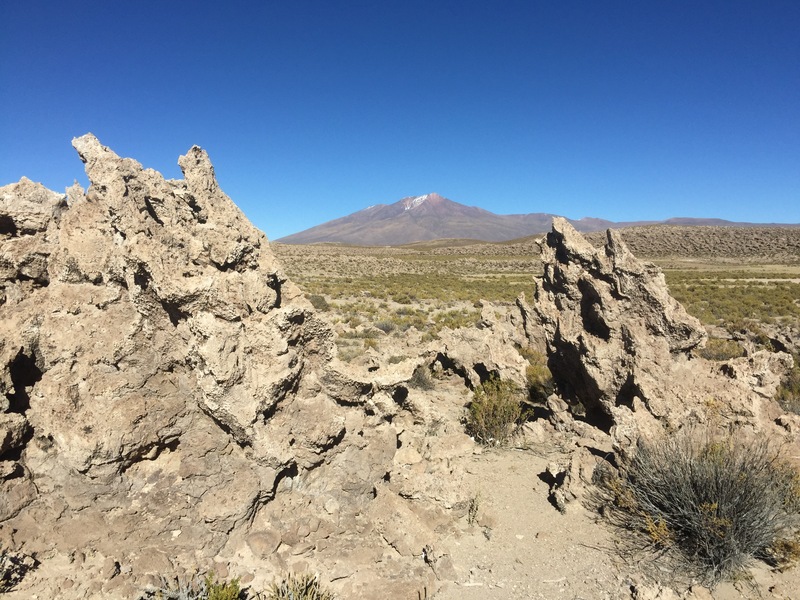 First stop however was the crystal ‘galaxy’ caves, a series of caves in the cliff face which had only been discovered a few years earlier and were home to some impressive rock formations as well as an Inca burial ground. 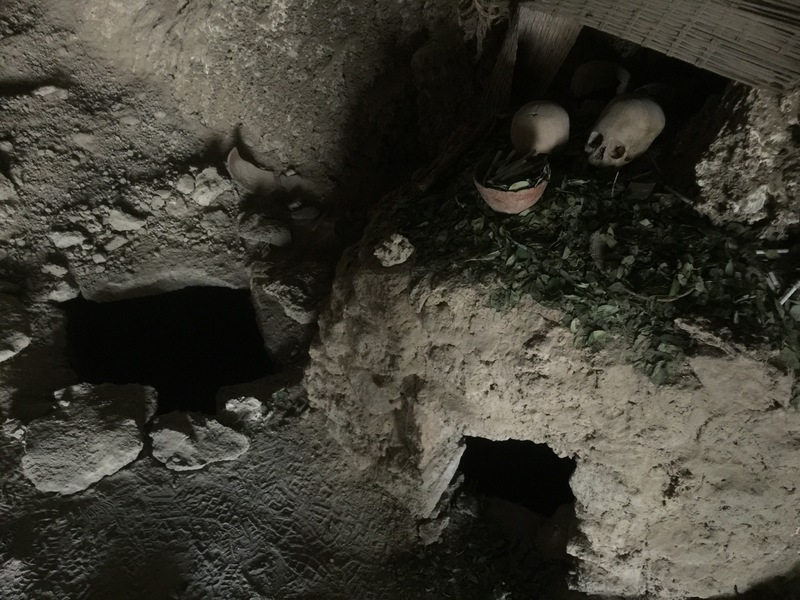 The burial Cave, hosted a number of open tombs and a few human skulls and bones. From the top of the cliff you got some impressive views out across the valleys and plains. Our local guide Vlad, explained that every hour or so during the day that the landscape and scenery would change drastically. It was hard to understand what he meant until we saw it for ourselves. Flat plains soon changed to razor sharp Coral rock formations called the ‘Stone Soldiers’, the result of 20 million years of tectonic plate movement which had raised the ocean floor to over 4,000m. The dramatic rocks weren’t quite the Terracotta Army but they made for an impressive photo. As we drove on the rocks and low scruffy shrubs turned to flat plains and Vlad explained that what looked like salt on the ground, was in fact Borax, a mineral used in cleaning detergents. We tried a few drone convey photos, but the choreography didn’t quite translate for the drivers who shot off ahead at 80km/h. 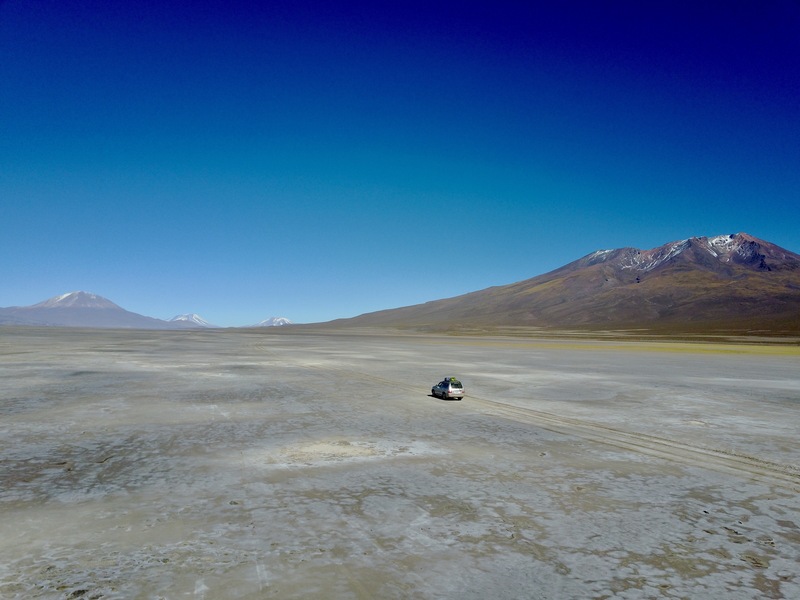 As we stopped to retrieve the drone, we paused alongside a railway just as a train carrying minerals to Chile passed by – it was the first traces of human contact we’d seen in hours. It’s hard to explain how isolated this part of the world is, except that only a few thousand people live in this region. If you got lost or broke down alone, you may not be found for days, if at all. As we passed the plains we began to climb rapidly, the vegetation became more sparse and we soon encountered pockets of snow on the ground. 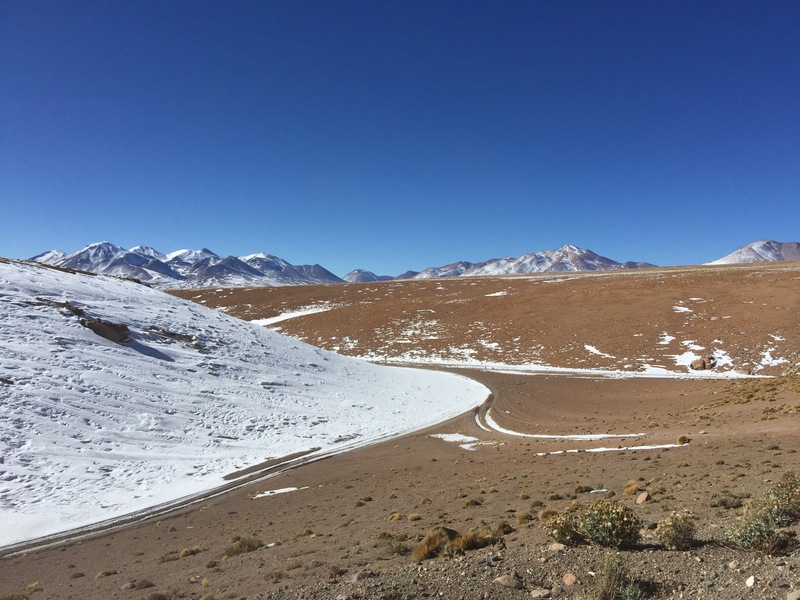 Despite the perfect blue skies, baking sun and the fact we were in the world’s driest desert, the snow wasn’t retreating. The higher we climbed the heavier the snow and it was obvious the local drivers were having the time of their lives, skidding and sliding down steep passes and ravines. By this point there was no road, just old tracks to follow and it was apparent how essential having local guides was. Vlad was amazed at the snow, which he described as the heaviest he’d seen since 2005 and probably the second heaviest in the twenty years he’d led tours in the area. Our route frequently appeared impassable and at times it was, we had to stop a number of times to dig out the 4x4s – back breaking work at altitude and in knee deep snow. Each time the drivers and guys jumped out, armed with shovels to dig us it and rocks for traction. Occasionally the hard work was broken up by an impromptu snowball fight and time to admire the scenery. On the outskirts of the national park we arrived at or first Lagoon, home to a few dozen flamingoes feeding beneath snow capped mountains. As it was already mid-afternoon we needed to make a move if we were to reach the famed Red Lagoon, however our luck soon ran out. Firstly, one of the 4x4s became beached on a large rock. There was no way to dig it out, instead we had to raise up the several tonne vehicle to give it clearance. We lost around 40mins getting it free, luckily there was no major damage and we hit the road again in convoy. As we hit the snow covered flats in the shadows of the mountains we encountered deep snow. Several times we skidded and veered off the road. We continued to plough on with waves of snow crashing over the car – but soon we discovered we’d lost a vehicle. The sun was beginning to lower behind the peaks and temperature plummeted. We waited for a while before our car headed back to search for the missing vehicle – we were certain we’d last seen it in the mirror a mile back but soon two, three and four miles had passed and no sign. On several occasions we hit deep snow drifts and thought that we ourselves would be lost but eventually we saw flashing lights and pulled up alongside – the guys had manfully replaced a flat time in artic temperatures and were finishing up just as we arrived. We hit the road again, meeting the other cars and charged towards the red lagoon but despite enjoying a spectacular sunset on the move, by the time we arrived at the Red Lagoon it was pitch black. 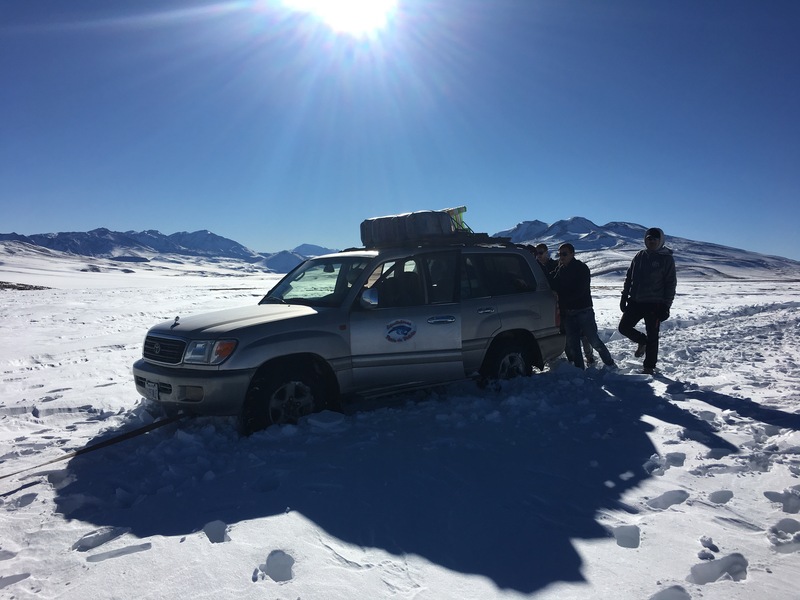 After checking in at the Park Rangers office we discovered we were only the third group of cars to make it through in a week…it took impressive team work to make it but unfortunately we still had a two hour drive on winding roads, in the dark to reach our homestay. The ‘roads’ would have been treacherous in the daylight, at night they felt lethal and we frequently lost sight of the other cars – only to find at one point they’d mistaken a dried up river bed for a road as we charged past. We arrived at our homestay around 8pm, cold, hungry and exhausted. The whole group looked shattered but after being allocated into dormitories we reconvened for games and food. We would all sleep well…or at least I hoped. Laid in our dorms I found it impossible to sleep – the air was so thin that you were gasping for air. All I could hear was the deep strained breathing of the other guys in the room. While we had a ‘lay in’ until 8am, we were all wide awake at 6am, although Marc was the only one who braved the ice cold shower. 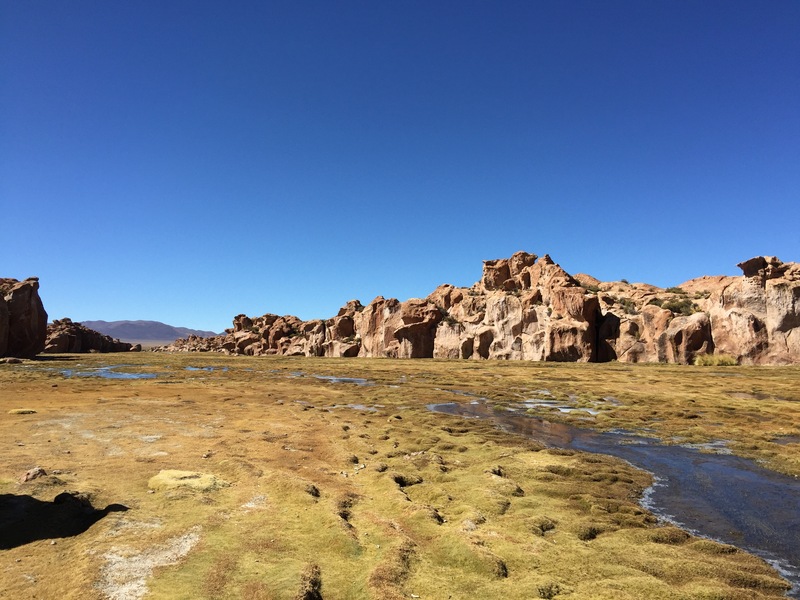 After a breakfast of pancakes and stale bread we loaded back into the 4x4s and headed back to Uyuni. Once again the scenery changed every few miles, mountainous desert turned into a nearly 50 mile lava flow, where we stopped for lunch in a Lagoon. 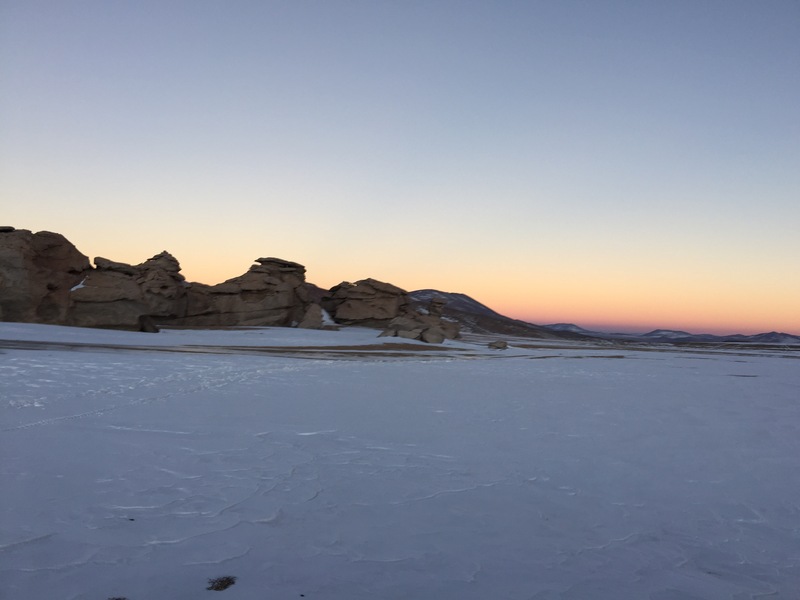 We took a few hours to climb through the rocksand canyons, seeing a striking contrast between dry landscape, frozen ponds and lush green swamps.